Keep close friends close with hike messenger.
? PRIVACY: With hike messenger say goodbye to stalkers! From your milk-man to your aunts to that creepy guy in college; you don't want them to be seeing your last-seen and profile pictures, do you? Switch to hike and take charge of your privacy! Choose who sees your Last Seen time stamp!
? STICKERS: Now send some amazing stickers on hike. Express yourself in a whole new cool way!
? CHAT THEMES: Everyone has backgrounds. We have 2-way themes! When you change the chat theme, it changes for your friends too! Let's add more character to messaging, shall we?
? FREE HIKE2SMS TO INDIA: We've also built in FREE hike to non-hike SMS. So if your friends aren't on hike you can still message them. And better yet, for free! Free SMS can only be sent to India.
? HIKE OFFLINE: Unable to message friends because they're not online? Don't worry! Hike does the hardwork to figure out if your friends are offline and then sends them your messages as an SMS, at no cost to you. When they reply, you get the message in hike!
? SHARING IS EASY: You can share photos, videos, location, contacts, walkie-talkie messages and much more on hike! Create group chats or chat one-on-one!
? HOLO: hike messenger is now designed for HOLO. With a big new user experience update, hike is now simpler, faster and even more beautiful than before.
? FAST, SIMPLE, PERSONAL, FREE: hike is super fast. With sent, delivered, read and typing notifications, it feels like you're having a chat with someone in person. The app uses your 2G, 3G or Wi-Fi (when available) to message with friends and family.
? MOVE TO SD CARD: The app can now be stored on the SD Card! Hike Messenger Free Mobile And.. 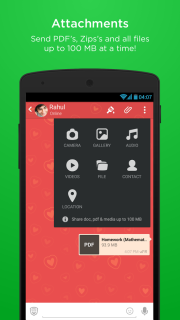 Hike Messenger For Android Pho..